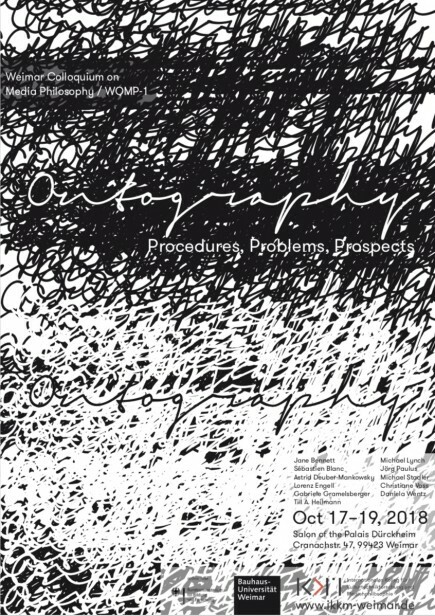 In recent years, the term ‘ontography’ has been re-discovered across various disciplines, in a number of contexts ranging from geography to literature, phenomenology to object-oriented ontology, and media philosophy. Denominating various forms of recording of and access to ontic reality without the mediation by language or consciousness, the term encompasses different kinds of medial processes and operations of tracing and registering the Real. This workshop seeks to explore and elaborate the possibilities the concept of ‘ontography’ allows for in terms of re-thinking media, the human, reality and their relation to one another… For more information on the workshop’s concept please see here: ikkm-weimar.de/veranstaltungen/alle/ontography-procedures-problems-prospects/.